MIDI Mapping allows you to map certain incoming MIDI messages to plugin parameter changes. This can be useful in a live setup, where a MIDI controller can be used to directly tweak plugin parameters, or simply to directly record parameter changes to the pattern editor. You can open this dialog from the View menu or use the “Learn” mode by pressing Shift while modifying a parameter in an active plugin GUI. The modified plugin and plugin parameter are then automatically filled into the appropriate fields. MIDI Mapping settings are saved in modules, so they do not have to be re-entered when loading a previously edited module. This is the currently edited MIDI Mapping. MIDI Learn: When this box is checked, OpenMPT will listen for incoming MIDI events and fill in Channel, Event and Controller values automatically. Active: Checking this box enables this MIDI Mapping. Capture: Checking this box prevents the MIDI message from being transmitted to other MIDI Mappings listening to the same MIDI event or even other parts of the program such as any open plugin editors or the pattern editor, where the controller change may be written down as a MIDI Macro command. Pattern Record: Checking this box will enter the parameter change into the Pattern as a Parameter Control Event, so it is only available in MPTM tracks. Channel: The MIDI Channel (1 – 16) OpenMPT will listen on to capture this event. When choosing Any, it will listen on all MIDI channels for this event. Event: The type of event OpenMPT should listen for: MIDI Control Changes (also known as MIDI CCs) and aftertouch events are currently supported. Controller: The MIDI CC message that OpenMPT will listen for to control the plugin parameter. Clicking on the field shows a list of MIDI CC messages from which you can choose. Plugin: The plugin that will be controlled by this event. Clicking on the field will open a list of the loaded plugins. Parameter: Here you can assign the plugin’s parameter you wish to control with the MIDI CC event. Clicking on the field shows a popup menu where you can choose the parameter to control. Add Event: Clicking on this button adds the event settings above to the MIDI Mapping list. Replace Event: Clicking on this button replaces the currently selected MIDI Mapping in the list with the event settings provided above. Remove Event: Clicking on this button removes the currently selected entry from the MIDI Mapping list. The MIDI Mapping list shows all available MIDI Mappings. You can use the Up and Down buttons to rearrange MIDI Mappings that cover the same MIDI event. The order of such MIDI Mappings may be crucial since the Capture setting can prevent an incoming MIDI event being redirected to subsequent MIDI Mappings. 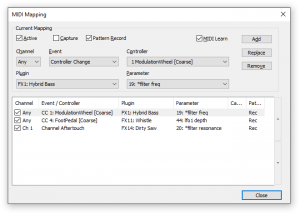 You may enable and disable any MIDI Mapping directly from this list by toggling its check box. This page was last edited on 28 April 2017, at 15:09.